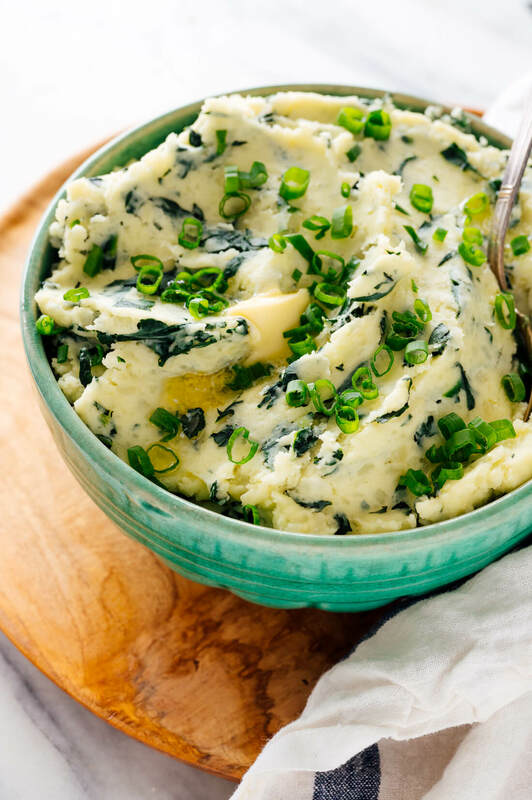 I based this colcannon recipe on my great-grandmother’s old-school mashed potatoes. Her recipe calls for cream cheese and sour cream instead of milk (or cream) and lots of butter. 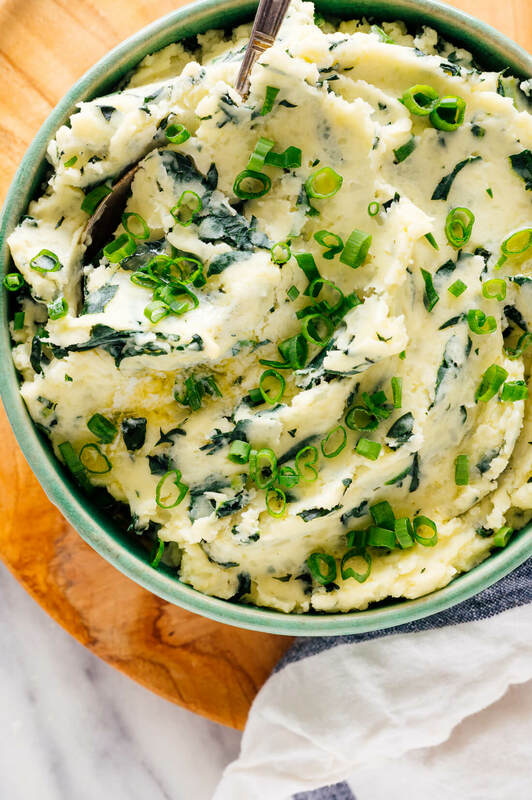 I’m obsessed with its tangy flavor and creamy texture, and I don’t want mashed potatoes any other way. I assumed these ingredients would produce an untraditional twist on colcannon, but maybe I was wrong. I just found an Irish song about colcannon on Wikipedia that mentions “pickled” cream. Apparently pickled cream is buttermilk, which is similarly tangy. Maybe cream cheese and sour cream aren’t such crazy substitutions after all. 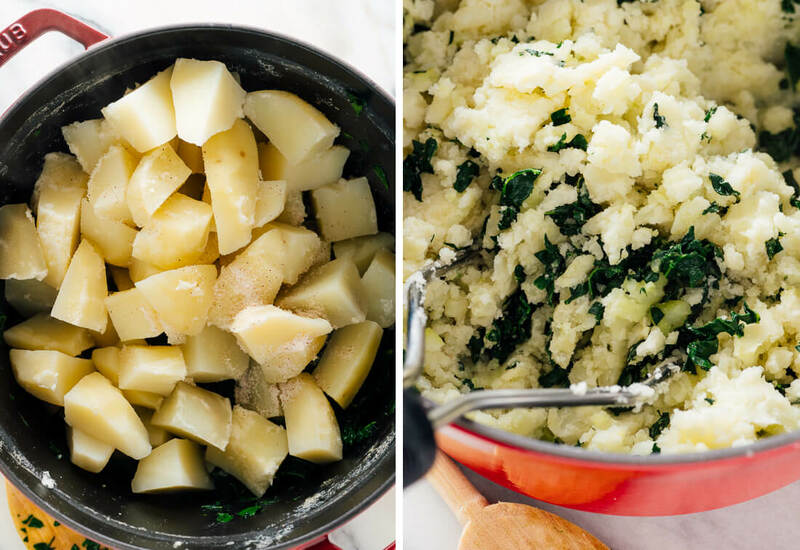 Wondering specifically what to serve with colcannon? Unfortunately, I don’t have any Irish entrées, but this roasted carrot, chickpea and farro dish would pair well with it. Looking for more St. Patrick’s Day recipes? You definitely don’t want to miss my Irish coffee recipe. 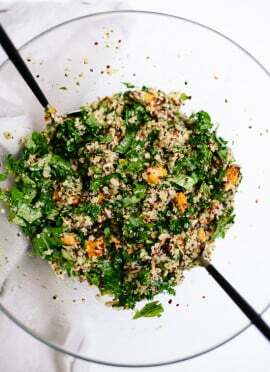 Please let me know how this recipe turns out for you in the comments! I’m always so eager to hear from you. 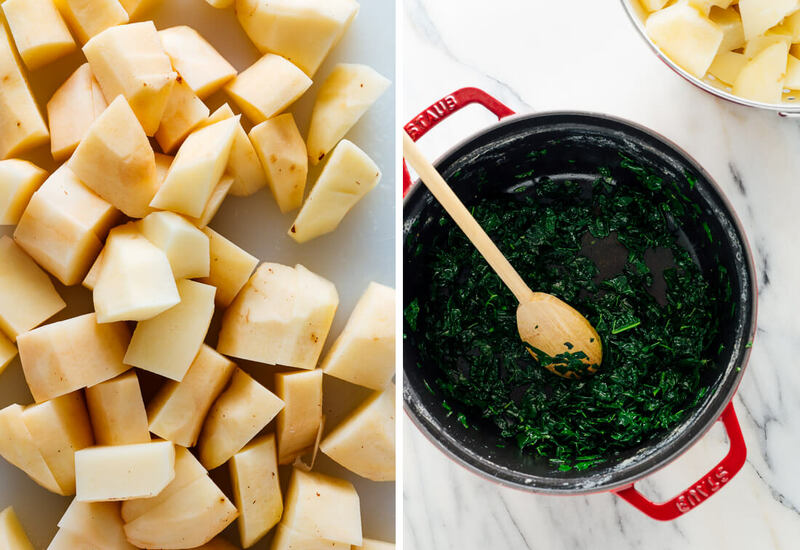 Make it dairy free/vegan: I haven’t tried this, but I think these potatoes would be good if you cooked the kale in olive oil, and stirred in 1 to 1 ½ cups vegan sour cream in place of the cream cheese and sour cream combination. Skip the extra butter. I will try to veganize this and let you know how it turns out. Sounds good! Well these look pretty amazing! I’ve never heard of Colcannon or had any veggie, other than peas, in my mashers. I think they would also make a perfect side dish for Easter. I am going to veganize them with your vegan sour cream recipe. Will let you know how it goes! Oh yes! Let me know what you think with the vegan sour cream. Thank you, Dani! I love this dish and usually make it with cabbage. If you use carrots it’s called Hutspot. It always great to up the nutrition and I love the garnish of spring onions which made the colcannon presentation pop! Hi Kate! I make this often, but with a twist: I form the potato mixture into patties, then FEB them (flour, eggs, bread crumbs – panko) then shallow fry them. They are delicious with a little extra crunch on the outside. I then put them on a cookie sheet and freeze them and put them in a zippered bag to take out as needed. Reheat in the oven and yum! Haven’t made them in a while, so thanks for bringing it back into my head and I will make it soon! Thanks for sharing your take, Rose! Hi all, this dish is always served with fish in Ireland. AND we always add a big knob of butter on top of the potatoes!!!! I’m interested to try your version! I came across the recipe “Irish Veg Stew with Kale Colcannon Mash” from Irish cooks & brothers David & Stephen Flynn (“The Happy Pear”) on Jamie Oliver’s site. You can serve the mash alongside the stew or drop some right in for yummy goodness! Let me know what you think, Beth! This looks crazy good. 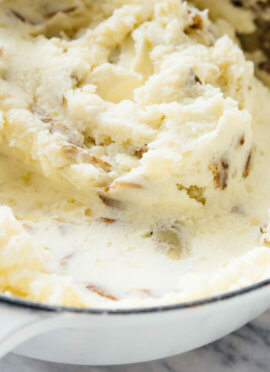 i wish i could have this “colcannon” for lunch today!! This comment is not about this recipe but I don’t know where else to leave you a note. Can you post a scalloped potato recipe sometime soon? I will add it to my suggestion list, Annie! What recipe plug in do you use!? I love your blog and style! Hi! It’s called WP Tasty and I customized the display myself. :) Glad you like it! SO good! We had it tonight with veggie Swedish meatballs and salad. My son (who is a sworn enemy of kale) said that he liked it!!! He even asked if I could make it again! Hooray! You are a genius! Hooray!! This dish has that power. :) Thank you for your review! These look delicious! 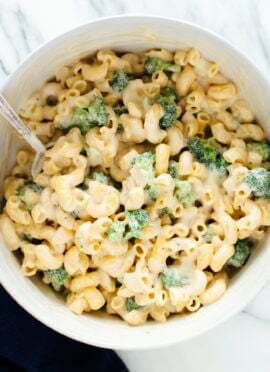 I love finding ways to make our St. Patrick’s Day food “green” in healthy ways! Thanks! 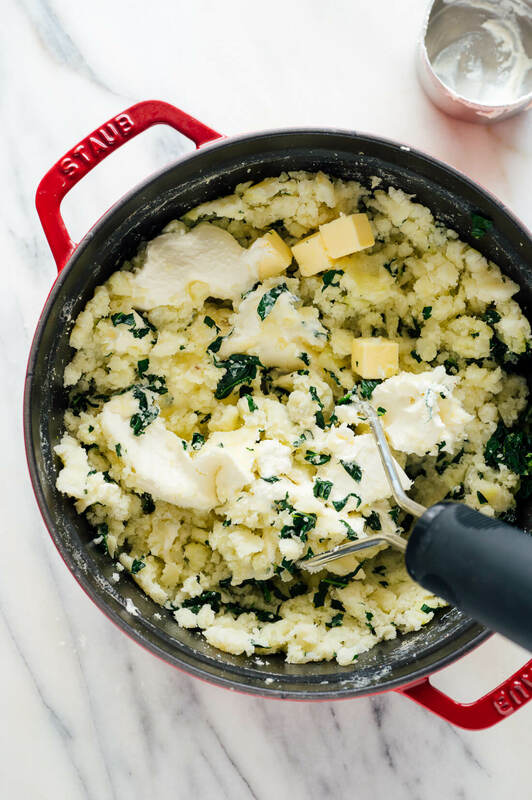 The family loved this version of Colcannon…it had a nice tang and was a good addition to our potluck dinner. Next time I will half the recipe for just my husband and I. Thank you for posting it in time for St. Paddy’s Day! I’ve been getting your recipes for a few months now, I think. I made the fresh potatos and kale dish, and LOVED IT! Thank you! I love how you chat, like writing a letter with the recipes, as I live alone, am now getting old (had a stroke and cancer in the last 1.5 yrs – over them both, mostly, now) and it feels like you are some company, come for coffee in the AM… lol. Thanks tho. I never had time to cook as a divorced working mom, (My kids now ignore me, the gist of that being that they feel I ‘ignored’ them, while I worked too much to bring them up…) and my mom wouldn’t let me in the kitchen as a girl, so you are actually giving me cooking hints… TEACHING me how to cook, almost.. Thanx for that too.. Thanks for commenting, Sonlit! I’m so happy you are enjoying the recipes and blog content.